The Green Girl did her very first run of the year on yesterday. I've been averaging a 15-16 minute mile on my Saturday morning runs. Since this was an 'Active Recovery' week and we would only be running for an hour, I was determined to pick up the pace. 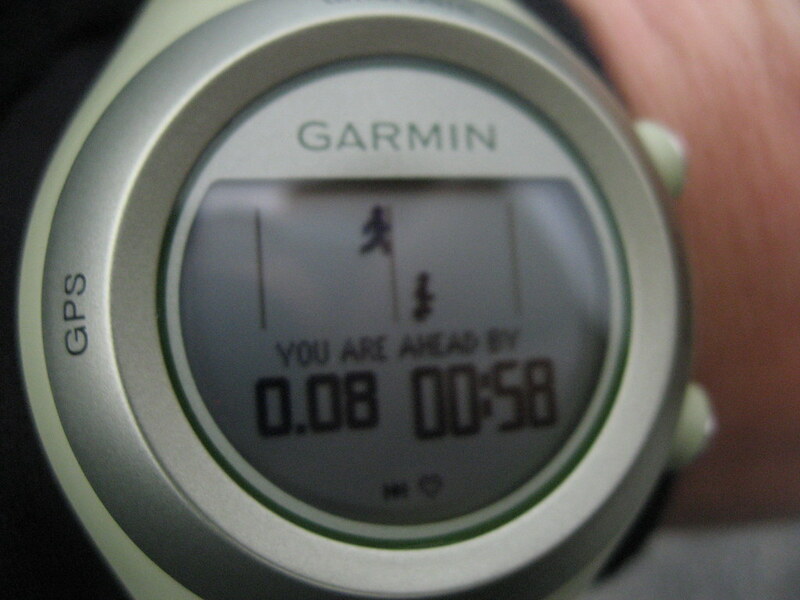 I set Mr. Green Garmin's 'Virtual Partner' to a 12:30 mile. The Virtual Partner appears as a little runner that 'runs' with you. For the first time since Mr. Green Garmin came into my life, I beat my Virtual Partner! When I saw my little digital body ahead of my Virtual Partner, I got so excited that I had to slow down and take a picture. Ha. The group I run with trains using the Chirunning technique. Part of Chirunning is maintaining a steady cadence. To achieve this, a number of us carry a Seiko DM-50 Clip-Style Metronomes with us on our runs. I typically set my metronome to 82 but sometimes I will increase the speed to 85. I found the continuous beeping to be an annoyance at first but I've grown accustomed to it and it really helps me maintain the cadence throughout my run. When I'm feeling tired, it's soothing to just zone out and just keep my feet moving to that beat. I really pushed myself. I was getting pretty tired after 25 minutes and thought about taking a walk break but for some reason, I kept going. It was exhausting but it was a lot easier for me to push myself than it used to be. I think all the short, fast runs really are helping. According to Mr. Green Garmin, I did a total of 4.84 miles in 59:01:24. The thing I am most proud of is the fact that I even managed to do negative splits. I did not think I'd be able to pull that off because I had pushed myself so hard going out. I averaged a 12:11 minute mile going out and a 12:09 coming back! 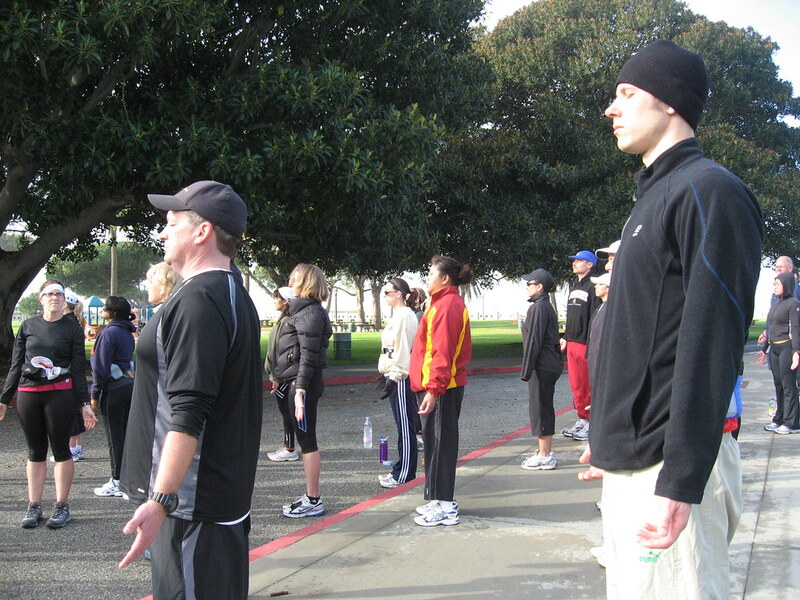 After the run, Coach Steve Mackel modified our usual post-run yoga to a standing-only session because the grass was too damp for us to use our mats.